Community School freshman Lilly Jenner fires a shot during her team’s 3-0 home win over Gooding Sept. 19 on the Sagewillow Farms pitch. Jenner scored twice in the game. Community School girls’ and boys’ varsity soccer teams ended their regular-season schedules on a positive note Wednesday with a lopsided win and a hard-earned tie at their Sagewillow Farms fields. Now, they will battle for state tournament berths in the High Desert Soccer Conference tournaments starting Saturday. Coach Kelly Feldman’s Cutthroat girls (12-2-1, 11-0-1 league) extended their unbeaten streak to 11 games and improved their home record to 6-0 with a lopsided 10-1 triumph Wednesday over the Wendell Trojans on the Elkhorn pitch. Junior Hannah Dies (team-high 20 goals season, 66 career) pumped home five goals. Junior defender Jordan Fitzgerald had a three-goal hat trick—her second hat trick ever and her first goals in two seasons since she had 15 as a freshman. Fitzgerald was playing in only her second game since rejoining the lineup from her concussion head injury. Whitney Engelmann and Josie Allison added singles. Katie Feldman and Lena Perenchio chipped in with assists. Freshman keeper Olivia Ott saved a Wendell penalty kick. 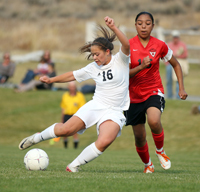 The Cutthroat girls host a second-round game at 4:30 p.m. Monday, Oct. 8 on their home Elkhorn pitch. They’ll play the winner of Saturday’s first round HDSC tourney game between No. 4 Wendell (3-7-2) and No. 5 Gooding (3-8-1). Other first-round girls’ games Saturday are No. 2 Bliss (8-2-2) vs. No. 7 Buhl (2-12-1, 2-9-1) and No. 3 Filer (6-6-4, 6-3-3) vs. No. 6 Declo (1-6-7, 1-5-6). Coach Richard Whitelaw’s Cutthroat boys (8-5-2, 6-4-2) played to a 1-1 draw with No. 2 seeded Wendell (8-2-2) on a first-half goal by Jay Fitzgerald. Whitelaw’s “Men of the Match” Wednesday were keeper Christopher Nalen and Will Harder. The No. 4-seeded Cutthroat boys play next Saturday, Oct. 6 at 4 p.m. against No. 5 Bliss (4-7-1) at SunWay Soccer Complex in Twin Falls. It will be the third game of the day, starting with Wendell vs. No. 7 Declo (1-12-0, 1-11-0) at 12 noon and No. 3 Buhl (10-3-2, 8-2-2) vs. No. 6 Filer (1-14-1, 1-10-1) at 2 p.m. If they beat Bliss Saturday, the Cutthroats will face the league’s top side, Gooding (9-1-2), on Monday, Oct. 8 at 4:30 p.m. on the Gooding field. Gooding beat the host Cutthroats 4-1 Sept. 19. The teams tied 2-2 at Gooding Aug. 27. This year the HDSC gets only two state berths for both the girls and boys. The HDSC championship games are Wednesday, Oct. 10. The second-place state-qualifying games are Thursday, Oct. 11 (girls) and Friday, Oct. 12 (boys).